Military Rings can be used to mark special occasions during a soldier’s career. A soldier’s achievements can be recorded on this small piece of jewelry. Rings are used to symbolize a soldier’s career and to create a legacy for generations to come. Rings are often used to symbolize graduations from an academy or specialized school. They are also beautiful reminders of one’s service in the United States Armed Forces. A very popular ring worn by members of the Armed Forces is the custom made Deployment Rings showing the dates of service. Deployment rings were designed to commemorate and record the involvement of service personnel in campaigns in the Middle East and Afghanistan. On the sides of the rings the campaign military emblems and insignias are displayed. And above each emblem the dates can be engraved. Military Rings are designed for the purpose of recognizing and commemorating life in the armed forces. The rings can be made in various sizes for men and women. A selection of metals is offered. The most popular is silver and gold. Celestrium is a jeweler’s metal can be toned to reflect silver or gold. The rings are similar in appearance to the traditional high school ring. The crown can be oval or square and enhanced with a gemstone to reflect the birth month. Some wear this ring for special occasions. Others wear them everyday as a testament to the sacrifice they have made in the line of duty. Gold Military Rings are durable and come with a lifetime warranty. Each ring is different in style and design which make them unique. They are made by creating a cast of the unit or military branch emblem. There are hundreds of military symbols available so each ring can be unique in appearance. Besides selecting a color for the gemstone other areas of the ring can be custom engraved. Custom wording around the stone will indicate the branch you served with. On both sides of the ring you can select two military emblems that will indicate the unit or division you served with. There is also a space above the emblems to engrave texts. The text can indicate your rank and name. Many soldiers like to engrave a date on the ring to mark an enlistment or retirement. If you are looking for a special gift for your loved one, custom military rings should be on your list. They are ideal to commemorate a promotion, a deployment, a birthday or a military retirement. Personalized rings shows your appreciation for their service, dedication, and sacrifice. In the future it will become a valuable and unique family heirloom. Take a moment to look at the diagram (above) of how to customize a military ring. The same procedure is carried out for all branch rings. Images and side emblems are available in the drop down menu in the shop for design purposes. You will have ample space in the text areas to input names and dates. Please read the note in the design area with regard to the amount of text you can have. Remember to have your ring sized by a competent and professional jeweler. The current sizes range from six to fifteen and include half sizes. The average delivery time for custom made rings is four to five weeks. During busy shopping periods, please allow an extra week for shipping. Whether you are moving on from secondary school or the military, you or your family might most likely want to check the event with an exceptional blessing or token. After all, it’s an exceptionally unique minute in any individual’s life and an extremely glad minute; you’ve buckled down, yielded a considerable measure of your time and were trained to put forth a concentrated effort to get past. Life in the military doesn’t end why service personnel finish a campaign or retire from the forces. People in the services retire to become valued veterans and the memories and scars stay with them. A military ring provides an opportunity to commemorate this legacy in a beautiful, personal piece of jewelry. These rings are a great gift for a loved one that served in the military. Recipients are often veterans that have recently retired from service. This could be a form of leaving present from the regiment, or perhaps a token of appreciation from family. Many military spouses will buy these for their loved ones as a symbol of love and respect. Just because they are no longer on active duty, that doesn’t mean they aren’t still a part of the military. These rings may also serve as great anniversary presents for those that retired many years ago. Loved ones can present this ring to commemorate a parent or grandparents service. This helps to remind veterans that their efforts will never be forgotten. The other reason for the popularity of these rings is the ease of customization. This isn’t a one-size-fits-all option that lumps all veterans together. Instead, families can create something deeply personal and significant. They can do so in a number of ways. The first consideration here is with the branch of the military. The best jewelers will not discriminate between the different areas of service. There are many consumers that will be in the market for army rings for those that recently served overseas. However, there are also options for those attached to the US Navy, Air Forces, Marine Corps and the Coast Guard. The name of the branch surrounds a center stone in big, bold letters. On the subject of discrimination, there are women’s military rings on offer as well as men’s. All service personnel, regardless of gender, race or sexuality, have the right to beautiful customized military jewelry. Then there is the use of materials within the ring. 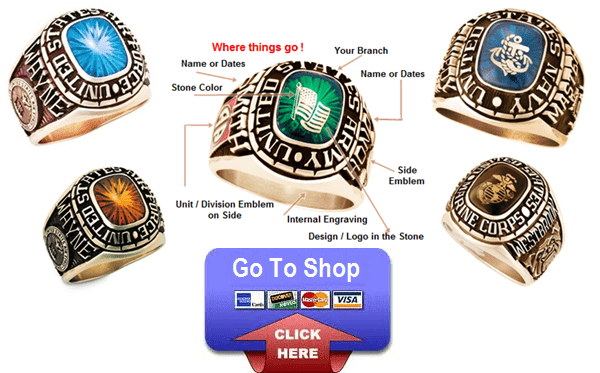 The stone in the center of these personalized military rings is an important starting point. The look and the color may have some significance to the wearer and their service. Or, they just might have a preference for a certain stone. Then there is the metal of the ring itself. Some spouses may decide to opt for a 10-carat gold option as a sign of respect. These high-quality rings make a great statement. However, some veterans may feel that this is a little showy for their tastes. This is where it may be best to opt for a premium silver ring. In some cases, the silver may actually showcase the marks and engravings a little better. On that note, buyers also need to think about the customization. There are plenty of ways to add a more personal touch to these military rings. The best place to start when personalizing these military rings is with the symbols of the regiment – the close family where veterans bonded with other personnel. From there, families can add other symbols onto the stones, or perhaps inscriptions into the band. These inscriptions could signify the dates of service, a key conflict or just a note of appreciation. When all these different elements combine, buyers are left with a ring that is completely unique and personal. The combination of the insignia and stones play an important part in cementing the legacy of the wearer within their branch. The engravings and inscriptions take the ring to a whole other level. The end result is something that will be cherished for years to come. Proud veterans can wear this for the rest of their days. They can hold on to that strong physical connection to the armed forces. In the event of their passing, the ring can be passed down to loved ones as a memento and family heirloom. There are far more symbols of military service than medals and uniforms. Every serviceman is part of a strong unit. But, they also have their own personal story to tell. These customized military rings allow them to tell that story and wear their personal history with pride. They are a wonderful gift for anyone that has recently left the service.